The board of directors of MGIC Investment Corp. MTG has approved a share buyback program, authorizing the company to repurchase shares worth $200 million through 2020. On Apr 26, 2018, the board of directors had approved a share buyback program under which the company can repurchase up to $200 million shares by 2019. The company has bought back about 16 million shares worth $175 million. This marks more than 4% of common stock outstanding. The company still has $25 million worth shares remaining from its previous authorization. Riding on capital contribution and the reinsurance transaction entered in 2013, the company has significantly improved its capital position. A sturdy financial position backed by solid core operations enables the company to generate enough capital. This, in turn, positions it well to increase its payouts or engage in other shareholder-friendly moves. MGIC Investment intends to fund the buyback with existing $248 million cash and investments as of Dec 31, 2018. The company currently has about 356 million shares outstanding. Share repurchases boost a company’s earnings per share, book value as well as shareholder equity. Shares of MGIC Investment have gained 10% in a year’s time against the industry’s decline of 3%. 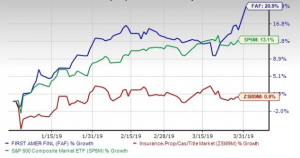 Higher premium, a decline in claim payments, decreasing delinquencies, an improving housing market, outstanding credit quality and new business are expected to help the stock retain momentum. The stock carries Zacks Rank #4 (Sell). Recently, the board of directors of another mortgage insurer Radian Group Inc. RDN expanded its share repurchase authorization to $250 million. Some better-ranked stocks from the insurance industry are Berkshire Hathaway Inc. BRK.B and Arch Capital Group Ltd. ACGL. Berkshire Hathaway provides property and casualty insurance and reinsurance plus life, accident and health reinsurance besides operating railroad systems in North America. The company came up with positive surprise in three of the preceding four reported quarters, with the average beat being 4.31%. The company is a Zacks #1 (Strong Buy) Ranked player. You can see https://www.zacks.com/stocks/buy-list/?ADID=zp_1link&ICI... _1link">the complete list of today’s Zacks #1 Rank stocks here. Arch Capital Group provides property, casualty and mortgage insurance and reinsurance products worldwide. The company delivered positive surprise in all the last four reported quarters, with the average being 14.72%. The company has a Zacks Rank of 2 (Buy).